Hello! I am thrilled to be part of the Inspy Romance team, and I look forward to getting to know everyone. I’ve been a fan of Inspy Romance since the first post and secretly wished one day that I could be one of the participating authors. When I write that this is an honor, it truly is. I’m a contemporary romance author who encourages audiences to surrender the good, the bad, and—maybe one day—the chocolate. I believe freedom in Christ truly comes when we surrender. My first series is called Surrendering Time with ENTRUSTED, ENTANGLED, and the June release, ENGAGED. They feature the themes of letting go of fear, loss, change, regret, and our plans. I’m also developing my next series, six books about surrendering what other people think. It will be about sextuplets with unique circumstances. That’s all I can say for now, but I’m super excited. I have a team of readers working with me and the ideas are flowing. I’ll definitely keep you posted. One thing I love to do is talk with readers about the writing process. I’ve held a book club through my local church in Youngstown, Ohio, the last two summers and talked about the “what if.” This is what motivates my writing. I am constantly looking at daily situations and asking, “What if?” To me, a parking lot is a scene of a potential carjacking or reunion scene. A mall is overwhelming because I have so many ideas when I people-watch. ENTRUSTED came to be when I first visited the Adirondack Mountains and wondered what if a city-girl moved to the mountains and wanted to belong. Thankfully, I married someone who puts up with my imagination. Before I met him, I fancied myself a Lois Lane type on a journey to find her Clark. When Tom came along, I visualized a God-nudge where He asked, “What if I gave you a man who is new in his Christian faith, ten years older, divorced, who has two children?” With all my scenarios, I have to confess, that was never one I saw coming. Twenty years later, those two children both married and are expecting their first children. Tom and I had two kids, and they are a freshman in college and a middle schooler. Our youngest has Albrights Hereditary Osteodystrophy, congenital hypothyroidism, and issues stemming from her first year. She has taught us so much about joy and overcoming. We’ve lived in Ohio for 12 years, and both grew up in Upstate NY. Tom and I are from the same hometown and even attended the same church, but never met until we were adults. The ultimate “What If?” about us is that when my dad was growing up, he was sent to live with his married brother and wife. My dad’s sister-in-law had her sister also living there. The sister? Tom’s mom. Turns out that my uncle married Tom’s aunt. Because I knew the Arduini family before I met Tom, this was a huge joke for years. Tom’s brother had to convince him I wasn’t really related to him before he asked me out! I love using Upstate NY settings in my writing. I don’t know of a lot of rural NY locations in contemporary romances, so my hope is to feature the Finger Lakes, Rochester, Syracuse, and smaller towns surrounding those areas. Since I’m new, can I ask a “What If?” What if I offered a giveaway? 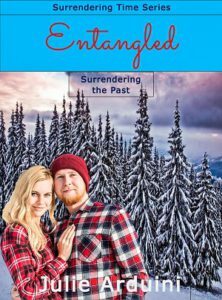 I’d love to show how glad I am to be here by offering a choice of either softcover or eBook versions of ENTRUSTED and ENTANGLED to one US/Canadian winner. 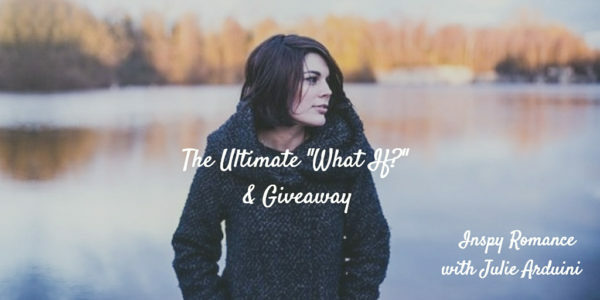 Leave a comment about a “What If?” in your life, an Upstate NY experience, or something about surrender or chocolate. I’ll choose a random comment by 6pm Eastern Friday, April 14th. Welcome, Julie! It’s wonderful to have you here at Inspyromance. That’s a great “what if?” story! Thank you, Jill! I’m thrilled to be here! Welcome Julie. My husband and I lived in Upstate NY after we got married. We were in the Finger Lakes region down at Cayuga lake. We still talk foundly of it and hope to go back many times to visit. Last year we went back and decided to also visit the Adirondack Mountains, which had been in our list for a long time but it took us moving out before visiting. Hiking up mountains and climbing a fire tower was so much fun.. even 4 months pregnant. Priscila, thank you! I know exactly where Cayuga is. Before I moved to Ohio, I was close to Seneca Lake, and my husband spent his childhood summers on Waneta. My hope is to include these places in my future books. Kudos to you hiling the ADKS while pregnant! I hiked the falls in Ithaca at 8 months pregnant and that was not pretty at all! We actually lived in Ithaca and loved to be surrounded by gorges and falls everywhere (I’d really enjoy reading a story from the area). I’m guessing regardless of which fall you hiked, they are a lot more steep than the one we did. Also, at 8 months, you’re much braver than me. Hi Julie, nice to meet you and thanks for sharing your story. I love how God brings people together! I often wonder ‘what if’ my mum had not re-married and moved us to a new state and new city after I completed year 10. At the time I thought it was the worst thing that could ever happen, but looking back- wow, how God used that to grow and stretch me, what a blessing! Thank you, Wemble! I am just wired to look at the “What If’s.” Sometimes they take a crazy trail, but when I look at it in context to my life, like you, I realize God’s hand in all things. Have a blessed Easter! Hi Julie and welcome to Inspy Romance. Being retired and working on our families’ genealogies, my husband and I often play What if??? What if my great uncle had not stolen my grandfather’s passport in 1914 to immigrate to the United States from Russia? or What if my parents in 1955 had not immigrated to the United States and I was raised behind the Iron Curtain? Glad the Lord guides and leads our lives. Blessings and Happy Writing! Renate, thank you! That is so fun! Those are great “what if” scenarios. I can see where that would be a perfect backdrop for a historical romance. Have a blessed Easter week! Hi, Brandy! Sounds like we have a similar “what if.” Tom doesn’t see the situation as funny as I do, because he doesn’t want anyone to think he married his cousin, LOL. We truly are not related, and I think it’s a great story. Even better was my maiden name is Tong and in our hometown there was another Tong family who was not related. Our name came about from a Hatfield/McCoy type feud and my Grandfather changed his name. My cousin Sam met a girl named Pam. Pam was from the other Tong family. They got married, and she never had to change her name. How crazy is that!? Hi Julie! I would love to read about the small towns in upstate NY. It is so beautiful there! Iraines78, it is beautiful here. My next series will be based on my hometown of Corning, the glass capital of the world. I’m really excited, and I am happy that I was able to use the Adirondacks as the backdrop of my first series. I hope you check them out! Hi, Colleen! Yes, the cold is hard to take, the snow can pile up fast, too. You have a great “what if” scenario. He certainly is good. Melanie, I love it! Sounds like you could use your own story for a great romance. I know I’d read it! I loved the blog post. My what if studio to become a nurse nearly 50 years ago and the joy of being a a traveling nurse,meeting new people. Thank you, Linda! I bet as a nurse you come across amazing “what if” stories every day. With the health stuff we’ve dealt with, nurses have made all the difference. Thank you for what you do! Thank you, Autumn! I’m so happy to be here! What if I hadn’t obeyed the Lord and gone to Cambodia? The people I met there became family! That’s such a great “What If?” I love it! “What if…?” The vital question every author learns to ask, over and over! From it, stories are born. Yes! I watched a movie years ago, it wasn’t great, but it was the same concept. It was called Doors, I think. They took the same character and split the movie in two, all because of how she chose a door. It was the ultimate “What If” for sure. Julie, thanks for sharing your fascinating story. What an interesting post! I enjoyed learning more about you, Julie. Thanks for sharing. I appreciate you reading, Winnie! Have a blessed Easter. Hi Julie! Welcome! Thanks for sharing your story. My husband and I had a similar situation like you and Tom. His uncle is married with my father’s cousin. We knew each other for long and all our friends thought we were cousins, we had to explain to them we weren’t even related once we started dating. Laura, that’s so funny! It really does take explanation but it makes for great conversation, doesn’t it? Welcome, Julie–looking forward to learning more about you and your work. Very interesting post, Julie!! Thanks for sharing!! What if we hadn’t gone to church that morning and singles Sunday school? Would we have met? Our special children wouldn’t have the best Daddy in the world to adopt them. O my what if either of us stayed home??? Sandee, you chose the best “What If?” by going that morning! Welcome! Glad to have you at Inspy! Welcome Julie! Glad you’re here. My family and I were involved in a pretty serious car accident a few years ago and I would sometimes let myself start going down the “what if?” path. What if we had left later or not stopped for gas or to check the luggage rack or… but I realized that I can’t go down that path because for the one time something bad happened how many other times have I have avoided an accident because of a small delay. I realized I just needed to thank God for protecting us and bringing healing to us. Jessica, I can relate to this. I had a car accident when I was pregnant and although everything worked out, I really struggled with the “What If” aspect. I was so involved in it that I was missing the many current blessings. He does protect and heal and do so much we aren’t even aware of. I used to think “what if” in a negative sense – “what if” I’d done this or not done that…I’ve long since gotten past that and haven’t thought “what if” in a long time. You’re use of “what if” is so positive and FUN! :) You’re books look good – I’m glad to “meet” another new to me author. Elizabeth, my family is used to the fact that nothing is a normal errand with me. We bought my car from a woman named Natasha with a thick Russian accent and when she went to the back, my husband leaned over and said, “You totally think she’s a spy, don’t you?” And he was right. I had the whole scenario played out. My speaker has a crackle in it and he even knew I figured it was a bug. The imagination of an author never shuts down! Thanks for reading! I’d love to be in the draw for paperback copies of your books. They sure sound really great! Thanks for the chance to win. Hi, Trixi! I know when I have used the “what if” with my own life, I’ve clearly seen God had such a better plan for me. I’m so glad you’re here, and appreciate you leaving a comment! I am Rachael, though many call me Rae. Mother if 3, yes, 3 small boys ages 4, 2.5 and 5 months. And yes, we do plan to stop here! I met my husband (just passed the 9 year anniversary last month! Whoop!) at a Summer camp for our church organization. He was 14, and I was 17. ‘What if?’ God allowed me to run off His path for my life, and I never asked to work as a group leader several years later? I would never have gotten to know my husband as anything but a “kid”. I am thankful for the years of getting to know each other as friends first, and allowing something more to blossom. I wasnt, and have never been disappointed that God had this self assured musician and songwriter picked out for me! That’s a beautiful story! Starting as friends is the best possible way. What a lovely “What if?” story.